Very briefly, go see. In the open exhibition that runs until 18th February there is too much to mention,except for the Guide to Getting Lost by Jennie Savage . This must be, firstly as it’s a lovely idea, secondly as it features Marrakesh and I’m off there next week and thirdly, because it would be much better if you were allowed to go out and get lost with it, I was only allowed to walk round and round the gallery with it and think the work lost a lot of it’s point that way. I recommend insisting you take the guide for a proper walk. Went to see An Unfinished World at MOMA in Oxford yesterday. 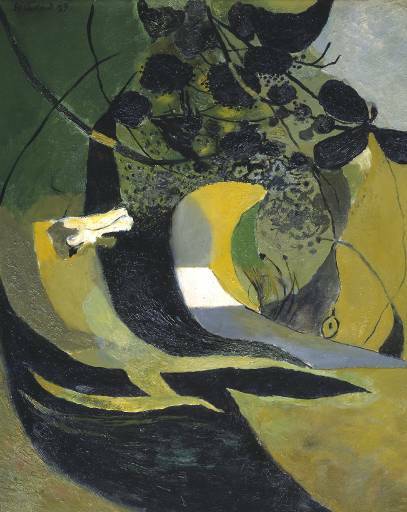 85 of Graham Sutherland’s works on paper, curated by George Shaw. All landscapes or bombed buildings and mines, looking like landscapes. Landscapes looking like bodies, no bodies but many paths implying the route a body might take into them. I love the life in his marks describing the physicality of the surfaces and the light and darkness that carve the spaces. Especially I love his use of colour, twilight hues on edge and magical, a bit like Henri Rousseau.